"Brachiosaurus" when translated means "arm lizard," but shouldn't that be "neck lizard"? Just look at that neck! Here's the story: It acquired the name because its front legs were significantly longer than its hind legs, which we suppose looked like arms to the namer(s). This caused its long neck to be automatically pointed upwards, enabling it to eat taller plants with less effort. 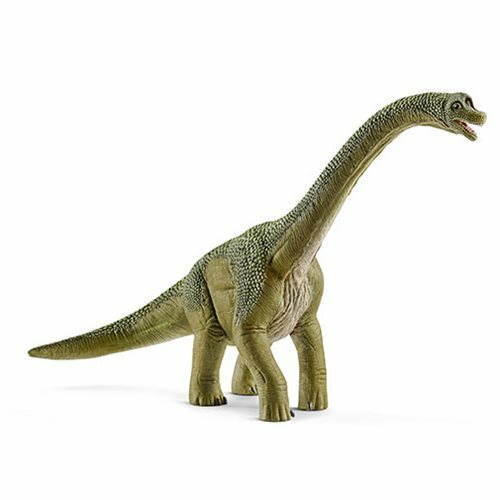 The magnificent beast is recreated here in this sweetly detailed Schleich Dinosaur Brachiosaurus Collectible Figure. Measuring about 9 1/2-inches long x 7 2/5-inches tall, it comes with an informative booklet!